On occasion I get asked fashion and style questions that range in topic. It’s one of those things that once people know that I contribute to Pattern as well as my own blog, they come to me with their questions and ask for advice. I haven’t done it in a while, so I decided that after an eventful Memorial day weekend I would post some of the recent ones. If you have questions or want advice from some professionals you can tweet to @Patternindy or send it my way @_Jeremiah_. Pattern has a great network of diverse resources to get your questions answered. ANSWER: It is never okay to wear carpenter jeans unless you are, in fact, a carpenter, and even then you should get a tool belt to hold your hammer. Gentleman denim is a staple in our wardrobe. If you are old enough to be drinking in a bar, you are old enough to wear quality denim. Quality denim doesn’t have to mean expensive. I have denim from a few places. Big Star, Express, Free World, and H&M are the top brands I personally wear. More important than the brand are 3 things: Color, Fit/cut, and Detail. 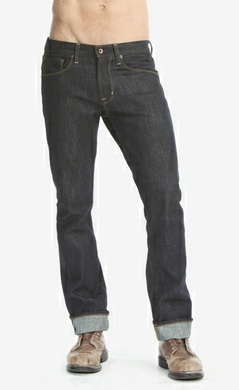 A guy should have at least 3 washes of denim: dark denim, light wash denim, and a gray or black denim. The fit should be a fit that is a proper length and isn’t to baggy in the leg. More important is the cut of denim. A straight leg is generally the most flexible and flattering fit for most body types. Stay away from the ultra slim leg denim if you are over the age of 18. Shorter guys should not wear boot cut denim because it makes them appear shorter. The detail of the denim is important based upon where you are wearing them. The more detail the more casual the look. Wearing a blazer with holey denim does not make the denim acceptable for anything other than an Abercrombie ad. 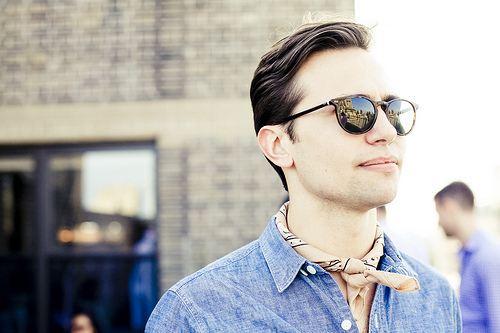 ANSWER: Summer is always a challenging time when it comes to accessories for guys. We are just starting what is sure to be a very hot and humid summer. Guys wearing anything more than a T shirt is a bonus. There is however one trend that I like a lot. It is the bandana around the neck. This trend has been around for a bit but just now starting to get a buzz on a larger scale. It’s a really cool look that I find looks best with another hot item for summer a chambray shirt. The good thing about this look is that you can really mix it up depending on the color and texture of the bandana. ANSWER: I could talk about this for a while so I am going to try and keep it short. A lot of companies put a lot of emphasis and effort into their branding. A very important and necessary step. However, for some reason, when it comes to business events most business teams look like they are a part of a weird, pleated dockers and polo shirts with the company logo cult. Talk about blah! and totally forgettable. What advice would you give if you were me? Tweet us @Patternindy or leave a comment.